Etoys is one of the most powerful tools on the XO — in terms of what it can do, how flexibly it can be used, and how it helps guide and facilitate thinking. This blog post from long-time OLPCer Sylvia Kist shows some of the research that has been done with children and Etoys on the XO. Can programming on Squeak Etoys on the XO laptop help students develop concepts about the Big Bang theory? Or about phenomena such as the Lunar Eclipse? About breast cancer? 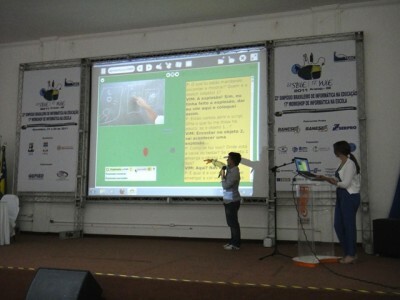 Working with Brazilian children and investigating their production, researchers from the Laboratory of Cognitive Studies of the Institute of Psychology of the Federal University of Rio Grande do Sul (LEC/UFRGS) have been examining the potential of programming activity on Squeak Etoys for authoring and conceptual development. In the cases analyzed, children created their own learning projects and developed forms of representing and simulating the issues they were investigating using Etoys. The pictures above show a student that developed a learning project on the question “What was the origin of the Big Bang?”. With Etoys, he tried to simulate the touch of two particles that might have started the Big Bang (according to the student’s first spontaneous ideas about the theory). 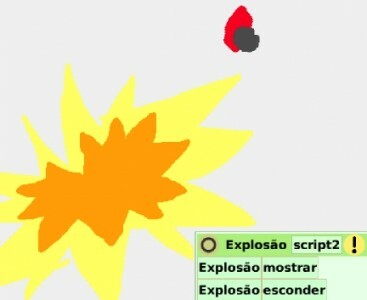 To get this result, he had to create different objects (particle 1, particle 2, an explosion) and to relate them through programming, coordinating propositions. This transition from practical knowledge to operational thinking follows Piaget´s theory and the clinical methods created by him and by Papert to study children´s activities on the computer. Based on this work, researchers have shown the benefits of programming for enriching thinking and the potential of Etoys to follow the steps of children’s learning construction. For further information about Squeak Etoys, see squeakland.org. The full paper is available in Portuguese. Previous Previous post: ¿La XO es un juguete? / Is the XO a toy?